His Beatitude Tikhon, Metropolitan of the Orthodox Church in America, asked Archpriest John Behr, Dean of St. Vladimir's Seminary, and Archpriest Steven Voytovich, Dean of St. Tikhon's Seminary, to accompany him to Kerala India, for the 200th anniversary of the Seminary in Kottayam! They will be traveling together for a week, beginning Friday, Nov. 20th, between this historic seminary and a sister seminary in Nagpur (also identified as STOTS!). Please check back here for updates during the course of the week, and photographs as well! 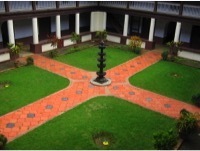 The seminaries in Kottayam and Nagpur are part of the Indian (Malankara) Orthodox Church. Both St. Vladimir's and St. Tikhon's have had Malankara seminarians from this region studying here in North America, so we look forward to seeing alumni in the course of our trip!